As if the ongoing economic crisis isn't enough for the international community to deal with, now we're facing a global outbreak of swine flu. Terrific. What next, you might ask yourself! Well, Benjamin Linus (former leader of the Others and ex-Dharma Initiative employee) has taken the opportunity to seize control of Canada. Presumably Linus was unwilling to face off against U.S. President Barack Obama, but Canada, with its lack of strong political leadership, offered little overt resistance to Linus' takeover plan. Canadian Prime Minister Stephen Harper is rumoured to have fled the country along with Finance Minister Jim Flaherty. 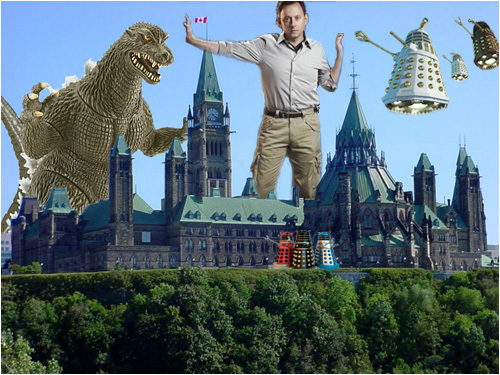 Pictured below a gigantic genetically altered Benjamin Linus directs an invasion team consisting of Godzilla and a select group of Daleks in Ottawa, the nation's capital. Linus is also said to have his eye on Australia, Peru, Lithuania and countless other countries. If anyone out there knows how to contact the Doctor now might be the time to give him a buzz. I bet he has the cure for swine flu just lying around the TARDIS too.